A fruit lover’s paradise. 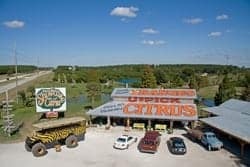 Stroll through acres and acres of Florida’s Orange Groves; check out 50+ varieties of citrus, ripe for the picking; Spread out your blanket and enjoy a picnic (shoes optional). And while your at it enjoy a monster truck off road Eco tour.